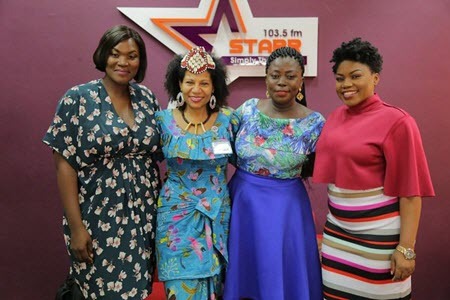 In her week- long trip to Ghana ,after being invited by Ghana office of All Africa Media Network , organisers of The African Women Intercultural Dialogue , Queen Diambi Kabatusuila Tshiyoyo Muata the brand Ambassador of the Dialogue took charge and made significant positive strides towards the success of the event, her trip which coincided with the Ghana at 60 Independence celebration offered her the opportunity to felicitate with the Ghanaian people and share her lofty ideas and message for All Africans. As a royal Mother, and Monarch of her people she paid courtesy visits to La Mantse and Sempe Mantse We, all in Accra Suburb, where she initiated a bilateral relationship between the Royalty and the people of the two traditional areas with hers in Bakwai Indu ,Kasai , in ancient Luba kingdom in Congo Dr.
” I bring you goodwill message from my people whom owns me and who I represent and seeking for a mutual union between our kingdoms, a road map towards successful collaboration that will lead to positive cultural exchange ,via traditional ,economic and social engagements that will yield positive success in the life of ordinary Africans as well as its statehood, I congratulate the people of Ghana for their historic achievement in becoming the first African Nation to reclaim its independence from its colonial masters as they celebrate 60 years of achieving this feat” she relates to La Mantse and Sempe Mantse We at her visits to their palace respectively. Her entreaties was welcomed by the two kings, who appreciated her visit and welcomed her warmly and told her of their gratitude and commended the humility in which she sought for the re-union of friendship and brotherhood among their traditional people ” Africa was once a continent without barriers, despite our little differences we recognised each other as brother. our people travelled to each other’s communities without VISA or Immigration cards ,though things have changed now, we shouldn’t allow the new trend of things change the fact that we are friends and brethren ” La Mantse said and assured of her of a new union between their respective communities. She attended the celebration of International Women’s Day event which was organised by the office of the First Lady Ghana Her Excellency Mrs Rebecca Akuffo Addo, where she also had a brief chat with some of the influential women that attended the event, including the former First Lady of Ghana and presidential flag bearer of NDP in the last presidential election in Ghana, Nana Konadu Agyeman Rawlings. Queen Diambi proceeded with a short media tour in Ghana, in which she first called upon Comrade Kwesi Pratt Publisher of Insight Newspaper, and they had a brief chat on the future of Pan- Africanism ,Comrade Kwesi Pratt gave her gifts that comprised of Books of the Legendary Kwame Nkrumah whom she had confessed to adore in their conversation, afterwards she was taken on a short tour of Pan African Tv Complex, which ended in an exclusive interview on Pan African Tv’s The Couch ,a tv program being hosted by Ama Pratt daughter of Comrade Kwesi Pratt, and one of the sizzling package in Pan African Tv programs, Pan Africa TV is live on air and broadcasts in 13 African countries, including the Democratic Republic of Congo. The graceful Queen Diambi Kabatusuila also attended the Global Women Mentoring Walk which was organised by Bridget Dzogbenuku of VV Lead Fellow Ghana , in which she communicated to the young women about the importance of learning about their history and their ancestral cultural Heritage to promote self esteem and pride in who they are so that they can have the confidence necessary to strive for the best in their life, which after she spoke to the correspondents of First Digital Tv Ghana. She honoured Kim Poole’s invite to Teaching Artists Institute where she spoke and adviced the African artists to charge of recreating the new Africa through their creative works which is spiritual and should embody the positive energy of Africa and push positive messages into the conscious and sub-consciousness of the Africa people ,in other to help in accelerating the much needed shift in paradigm in the continent.